You guys probably don’t know this but strawberry shortcakes are one of my all time favorite deserts so it was really only a matter of time before some showed up here on My Coffee Has Butter. I put a tiny twist on the classic desert and made mine with roasted strawberries. This makes them slightly more hands off and a lot more fancy. Seriously. 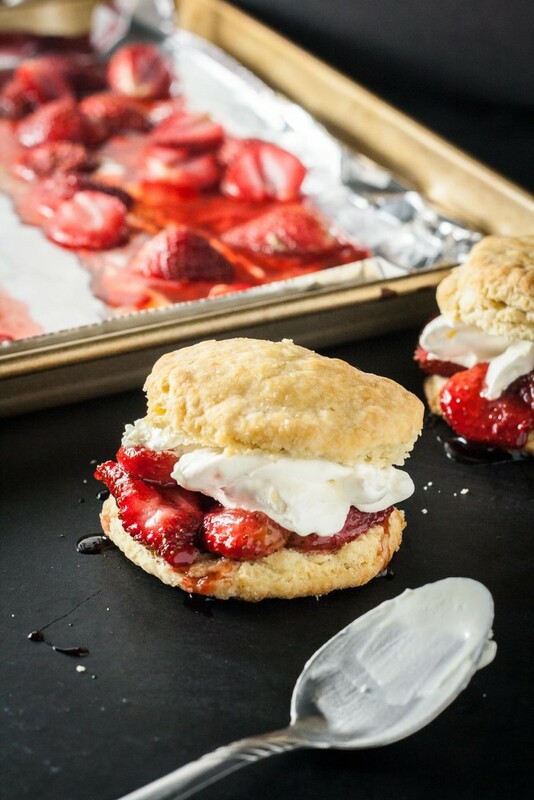 Tell people you’re making roasted strawberry shortcakes. I bet you $.45 they go “Oh?”. These roasted strawberry shortcakes are made almost entirely from scratch but they’re 100% worth it. The actual shortcake itself is reminiscent of a slightly sweetened biscuit. Not too sweet but just enough to marry with the strawberries and whipped cream. Want more posts like this in your inbox? Want to receive my eBook of Keto tips? You want a nice tender cake so being gentle with the dough is very important. The more you handle it, the tougher your dough will be and we’re going for tender, flaky goodness here. Now, let’s talk about the strawberries. 😍 Strawberries are a really amazing fruit because their growing season is INSANELY long. Pretty much any time of year there isn’t ice on the ground is strawberry season. There are at least 3 farms within 20 minutes of my house that allow you to come out and pick your own strawberries which is a pretty cool activity to do on a date. Then go home and make these shortcakes. Not a big fruit fan? Try this Walnut Streusel Bread! If you’re crunched for time and need to make these ahead of time for a party, every component of this recipe could be made a day ahead. Before the step where you press out the dough, form it into a disk and wrap it tightly with plastic wrap. The dough will last for 24 hours in the refrigerator. Make sure to let the dough sit out on the counter for about 20 minutes to make it easier to work with. If you don’t let it sit out, its likely the dough will break apart when you try to roll it. If you want want to make the strawberries ahead of time, you can. Keep them, roasted, in the refrigerator as well for about 2 days. They’re delicious cold, or you could let them sit out and come to room temperature. There’s NOTHING like eating them warm though. The roasting time for the actual strawberries themselves really kind of depends on you. 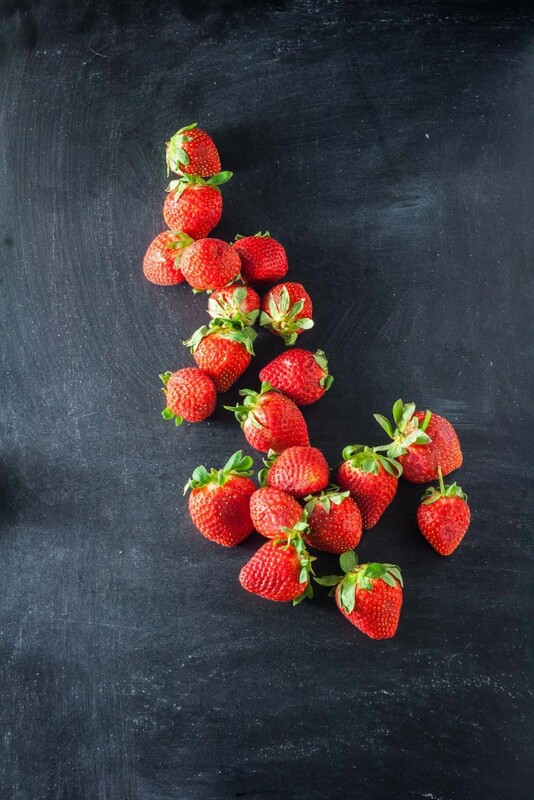 You might want your strawberries a little softer or firmer. You can keep an eye on them and test them with a fork or toothpick. They look incredible! I never roasted strawberries, that sounds fabulous! This is on my must try list! Haha we roast everything over here! I’m sure you’ll absolutely love them. 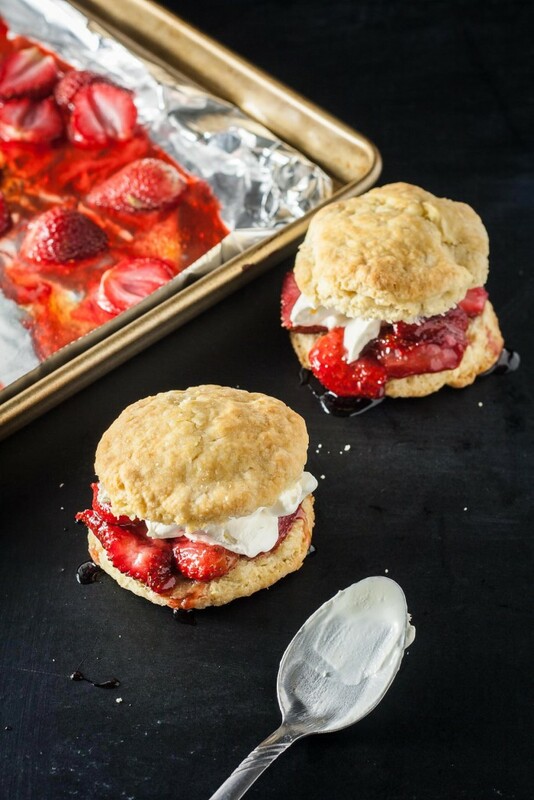 These strawberry shortcakes look so amazing that I don’t mind the effort of making them! Love this recipe! They are definitely worth the (minimal) hassle! Roasting the strawberries for this shortcake recipe takes this classic dessert to a whole new level. Looks delicious! Roasted strawberries? Yum! I’ll take two with a drizzle of balsamic reduction. Oh wow, a reduction would’ve been great! Looks and I bet tastes delicious. Love strawberry shortcake in any form. In season always have strawberries in house. Same here! I just love a good Strawberry Shortcake. I love how you’ve made these into individual portions because I’m usually tempted to over indulge. This recipe would be ideal for the summer but I bet it’s just as delicious at anytime of the year. Oh absolutely! Sometimes we freeze berries from the warmer months, that way we still have them once the weather gets cold. We’d call that a scone with strawberries, but whatever you call it, it looks amazing! Sharing! These remind me so much of my childhood but my mom never made her own biscuits! This looks amazing – I want to make them for my kids now! Aww, it’s so interesting what we remember from childhood. I’m sure your kids will love them!